Papergreat: Scholastic book cover: "Alvin's Secret Code"
It's been two years since Scholastic Fest, a countdown of my 25 favorite covers from vintage Scholastic Book Club books that I had on my shelves at that time. To see the countdown, click on the Scholastic Books label and scroll through 7 or 8 more recent (and also fun) posts until you get to the posts from Autumn 2014. For you enjoyment this morning, here are the details on another dandy Scholastic Book Services volume that I came across earlier this year. First sentence: Alvin Fernald had a warm, tingly feeling smack in the middle of his stomach. Last sentence: He knew he had given her the finest of medals. Notes: This is both a middle-grade book and a smart, detailed introduction to codes and cryptography. It doesn't talk down to the reader, and some serious types of secret codes are discussed in the book and appendix. ... This was the second of 10 books in author Hicks' series about the adventures of Alvin Fernald. Later volumes included Alvin Fernald, TV Anchorman and Alvin Fernald, Master of a Thousand Disguises. Fernald calls himself a "criptogruffer" in the book, a play on cryptographer. ... This book is a childhood favorite for many, and it has a 4.11-star rating (out of 5) on Goodreads. Reviewer Jorn writes: "I read this when I was a kid and I still remember parts of it vividly. Very clear explanations of various types and styles of codes woven into the plot." And Michael writes: "I read this book 37 times as a boy, and then a few more times as an adult. It got me interested in codes and ciphers, and as a writer may have been the first influence on me regarding the value of snappy dialogue." ... 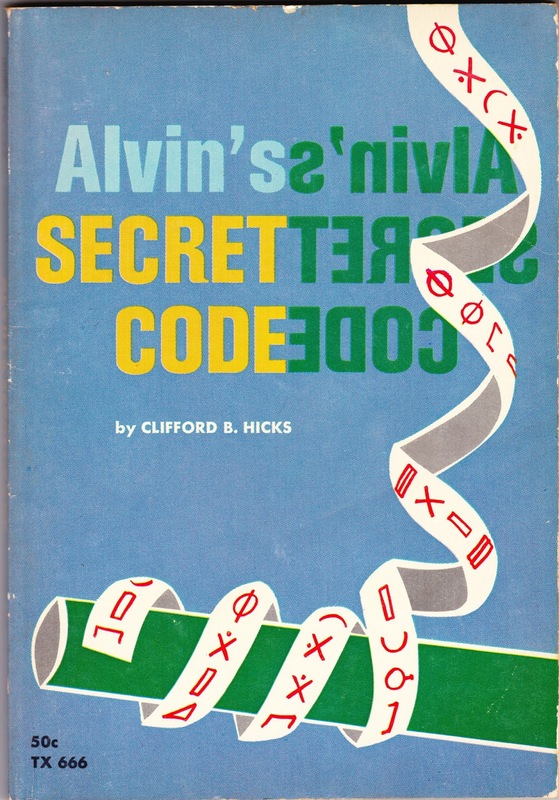 In a 2013 article in Riverside Insider, Lea Deesing, who had been newly hired as the Chief Innovation Officer for the city of Riverside, California, states that Alvin's Secret Code was the book that got her started on her career path. ... Ptera, who designed the cover for this edition, also designed the cover for Scholastic's 1966 edition of H.G. Wells' The Invisible Man. From here, a reader interested in cryptography could pretty easily jump into The Code Book by Simon Singh. And then, if you want the graduate-level course, you could check out Dave Kahn's hefty 1966 book The Codebreakers – The Story of Secret Writing, which was revised and republished in 1996 as The Codebreakers: The Comprehensive History of Secret Communication from Ancient Times to the Internet. Sarah and I were actually talking a bit about codes yesterday. We have The Imitation Game on our list of movies to watch soon. And we were talking a little bit about this semi-famous secret code. Does you know what it's from? Weirdly, I don't (off the top of my head) know that code!